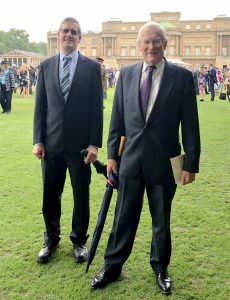 The Basingstoke Canal Society is very proud to announce that it was selected for The Queen’s Award for Voluntary Service recently. This unique UK national honour, equivalent to an MBE, was created by Her Majesty to mark the Golden Jubilee in 2002 and to recognise the outstanding contributions made to local communities by groups of volunteers. Society Chairman Philip Riley said: “We are absolutely delighted with the award. 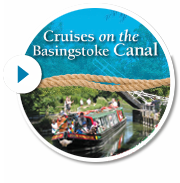 It acknowledges over half a century of effort by very many volunteers dedicated to the restoration and preservation of the beautiful Basingstoke Canal that runs for over 30 miles through Surrey and Hampshire”. The Society will be presented with a glass trophy and certificate signed by Her Majesty in due course. The Society was founded in 1966 following the publication in the local press of an open letter suggesting that something should be done about the then derelict canal. About 12 people responded and a campaign began to get the canal taken into public ownership. The Surrey and Hampshire County Councils were persuaded to go for full restoration as a navigable waterway by the promise of voluntary labour. Restoration of locks, bridges, weirs, embankments and cuttings, and dredging using a 50 year old steam powered dredger, began in the early 1970s and continued until the canal was officially re-opened by HRH the Duke of Kent in May 1991. Vice-chairman Martin Leech and chairman Philip Riley were invited to represent the Society at a Buckingham Palace garden party recently, in recognition of the Society having received the award. Once the canal was again open for visiting boats, the Society’s volunteers have continued to work to enhance it. Amongst the jobs done was the installation of a back-pumping scheme at St John’s in Woking to improve the water supply, resurfacing of the towpath between Crookham and Winchfield and between Fleet and Rushmoor, installation of moorings and lock landings and annual clearance of miles of bank growth. A very successful trip boat operation began in 1978 and continues to this day with the John Pinkerton II at Odiham and Kitty in Woking; they have raised over £800,000 for the canal. In 2016, the Society celebrated its 50th anniversary, and 25 years since the canal re-opening, with the hugely successful Woking Canal Festival, where we were joined by many visiting boats from the Historic Narrow Boat Club. Work on the canal is never finished. Director Ken Sankey said: “We must continue to help maintain the canal and, most importantly, tell people about this wonderful asset that we have. Accordingly we need more volunteers to give of their time to communicate with the press, help promote the canal in their local areas and to organise events. This can be as much or little time as people can spare, and it is rewarding and fun”. The other roles that the Society is looking to fill include Press Officer, Talks Organiser, Exhibitions Manager and Trip Boat Maintenance Engineer. Anyone interested please contact ken.sankey@nullbasingstoke-canal.org.uk.